Hello--I'm wondering if someone can help me with two Finalescript questions. I'm trying to add a footer to each page of some scores, and I can't seem to figure out the correct command to center a line of text at the bottom of each page. Also, is there any way to insert a graphic in the upper corner of each page? Any help would be appreciated! I suppose that the text block has the same contents on each page, like e. g. page number and title, right? No need to create multiple text blocks. In that case you only need one text block which you display on multiple pages, e. g. on all pages from Page 2 and onwards. Thanks for your reply--yes, I want the same text on each page. Can you tell me what the line of Finalescript should be to achieve this? Sorry, I do not know Finalescript. But since it is only one single text block, it may be just as fast to, just create that text block - without using Finalescript. This image has been viewed 261 time(s). Here is a script for the text block. It is copied below. It tried to attach the xml file, but that was not allowed. I tried to put it in a ZIP file and upload that folder, but that was also not allowed. //This script creates a Text block at the bottom of all pages. //Inserts text, centered at the bottom of the page. The text shown here is one of the inserts ("Text/Inserts/Title"). To use another insert, substitute a different insert for "title." To enter the text directly, substitute the wanted text for everything inside the quotation marks, e.g., "My Bottom Text." 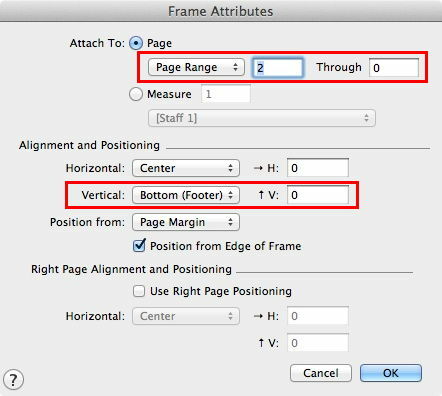 //To adjust the location of the text, substitute your own vertical or horizontal position locations for those in the script. //This type of script works well with a shortcut. open the script for editing. At the top check "Show in Menu," then click "Use Shortcut." Either enter a shortcut directly or let Finale pick one. Message "After clicking OK, be sure the mouse pointer is over the page. The text will first be created where the mouse cursor is located"
dropdown "All Pages" near "Attach To"
Dropdown "Bottom (Footer)" next "Vertical"
Dropdown "Page Margin" next "Position From"
This file has been downloaded 145 time(s). Thank you--I appreciate your help! I can't get the double click part of the script to work--everything else works great. Any other commands that you can use to create a double-click? I did find a slightly awkward work around. In the script, comment out the double click line by putting 2 forward slashes in front of it. This is to be sure the command is not interacting in some unexpected way. Select the text tool and manually double click somewhere on the page of music. Then run the script. When I did this, the dotted rectangle around where the text would be remained on the screen and the program proceeded to fill it as though it had been opened from within the script. Why is the double click not working? I don’t know. It is is a recognized Finalescript command. The only thing I can suggest is that you be sure the mouse is somewhere over the page of music as soon as you close the message. If it is in the window, but not over the image of the page of music, the program doesn’t understand and aborts.